Yes... a true 24 hour race on a simulator!!! I watched for a while last night before going to sleep and many of the GT3 class cars were banged up a lot. But considering 14 or 15 hours had already been run, I guess that was expected. One interview stated that they had a 40 minute pit stop early in the race but felt they still had a chance to podium on their class. Not sure if I felt more badly for the drivers or the poor guys who had to broadcast and talk about it for 24 hours. We had a 30 lap "Flying Avocado Racing Team" league race at Interlagos this morning just about the time the Daytona race was ending, so I didn't see the finish. Ting, Fishdeb, and me captured the podium in our F1s. It was a battle of pit strategies, tire wear and fuel calculations, as well as nerves with 3 or 4 lead changes near the end. Yes, I saw some complaining that their tires remained cold during the Daytona Race. Yep, awesome race run by the Farmer to claim the top step of the podium on Sunday at Interlagos! Just lucky last week. I had tested it without a pit stop using a lean fuel mixture and ran out of gas on the uphill section and ended up coasting backwards to the bottom of the hill, so I decided to pit and run full power. I noticed that you ran out of gas just before the finish line and coasted over it at over 100mph just 1.4 seconds behind me. Just about perfect fuel management! You should post a video of a hot lap at next week's Phillips Island. A beautiful track, but I'm struggling not to end up in the ocean or in the sand. First time I've driven on the track and there are a lot of blind turns when using a single monitor setup. A track with lots of high speed sweeping left hand turns and a couple slow speed (nasty) right handers to keep you awake. I'm wearing waterproof clothes just in case. You must actually pit to take fuel on board, but you CAN specify how much fuel you will take while out on track. For those not familiar, I can add that only some cars like the F1 has the ability to change the fuel mixture and power settings while driving because the real one has those controls. In most of the cars, only the throttle and aerodynamic setup control the amount of fuel you use. You can define how much fuel you start the race with during your garage setup... then you can set up hot keys to determine how much fuel the pit crew will put in during a stop. You can also define keys to request new tires or not during your pit stop. The weight of the fuel makes a big difference in the way the car handles. And if you put in more fuel during a pitstop than you have set up the suspension for, the car bottoms out on the suspension making it hard to drive until you burn some off, or even start scraping the track making sparks fly out the back and slowing you even more. The amount of time to put in fuel and/or change tires varies depending on the car also. On the F1, everything happens quickly but you lose a lot of time entering and exiting the pits due to speed limits. Go over the speed limit in the pits and you get a black flag requiring you to do a "stop and go" in the pits on the next lap. 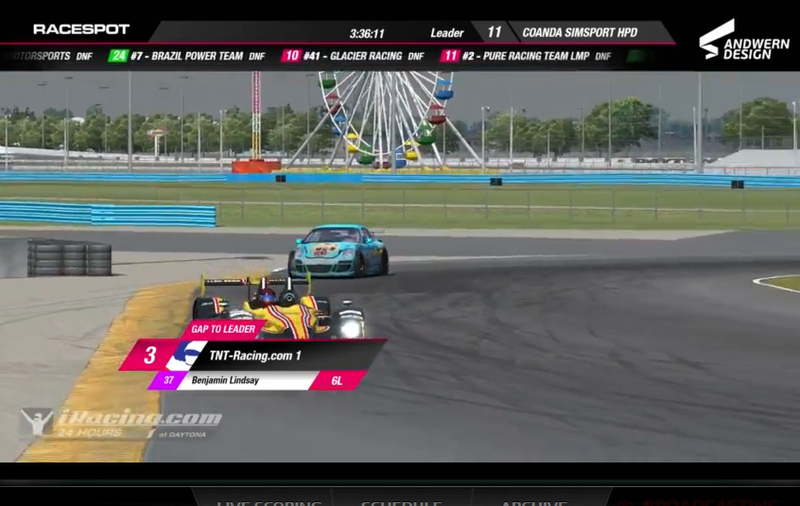 Screen shot of the last corner of the last lap. Ting pulled off another win this morning in our "Flying Avocado" league race at Phillips Island Circuit in Australia. We had a close battle in the closing laps only .758 of a second separating us at the finish line after a greuling 30 laps on the high-speed roller coaster track. Beanziecat captured the 3rd spot on the podium after FishDeb, who was running close behind most of the race, had a major spinout. Next week, we go head-to-head again on the Grand Prix circuit at Suzuki International in Japan. Packing my bags now. Way to go Flying Avacado's!!! TING, nice shot of you tearing up that track! You guys have an awesome team! how did you feel after race being that close at the line afterwards!? And after that many laps! Let's put it this way, I was still feeling the adrenalin pumping through my veins about an hour after the race was finished. 30 laps isn't a particular long race in iRacing, but Phillip Island is a track that needs your attention at all times. And for the last 8 laps there was less than a second between us which added to the need to focus. It was a matter of how fast you can run without making the slightest error. Push a little too hard and you lose. In our little league there is usually less than 2 seconds a lap difference between the fastest and slowest participant, so it is almost always an error that decides the race rather than speed. A simple spin or wheel in the grass can take 10 seconds off the clock by the time you get back to speed. A missed braking point and trip to a wall usually sends you to the pits which costs you a tow and repair time. Of course the idea is to have both the speed and consistency but that is tough, very very tough. Here is some clips of our last race.